Elio de Angelis, driving a JPS-Lotus won his first grand prix after a thrilling finish at the Austrian Grand Prix at the Österreichring, coming home by only five hundredths of a second from Keke Rosberg. Jacques Lafitte took third place in a Talbot-Ligier but was still lapped by the leaders in a race ravaged by accidents, and mechanical failures. Only seven of the 26 starters were running at the end. Rosberg moved into second place in the championship after John Watson in the McLaren and Alain Prost in the Renault retired with engine failure. Derek Daly was one of the first to retire when his Williams was involved in a start-line accident with Bruno Giacomelli and Andrea de Cesaris. Watson was held up and got away in last place, climbing to seventh before falling by the wayside. It set the tone of the day as only Rosberg of the championship contenders managed to score a point. Nelson Piquet led team-mate Riccardo Patrese as the Brabham team was again hoping to test its pit-stop idea. As yet, their chosen car hadn't been running at the required time in previous races. Behind them came Alain Prost's Renault and the Ferrari of Patrick Tambay which soon struggled with a puncture. That allowed Rene Arnoux up to fourth. Back in ninth was Keke Rosberg who gained ground when the Tolemans of Derek Warwick and Teo Fabi dropped out with suspension and driveshaft dramas respectively. Arnoux was next to go with a broken turbo and Piquet was struggling to keep up with Patrese. Piquet decided to pit, but he was eight laps early so the team wasn't ready for him. The pre-planned routine went by the board as the team scrambled to service the car. Patrese's stop was much better and the tyres and 24 gallons of fuel were taken in 14 seconds, slow by the standards of the following decades but astonishing at the time. On returning to the race, Patrese still led - the idea had been proved to work. He was three seconds ahead of Prost's Renault but three laps later the BMW engine detonated and Patrese's race was over, the engine's lack of reliability again the problem. That put Prost up front from de Angelis and Rosberg as Piquet had dropped out with the drive between crankshaft and camshaft having disappeared. Rosberg was carving on to the tail of de Angelis and it looked as though the battle was on for second place. 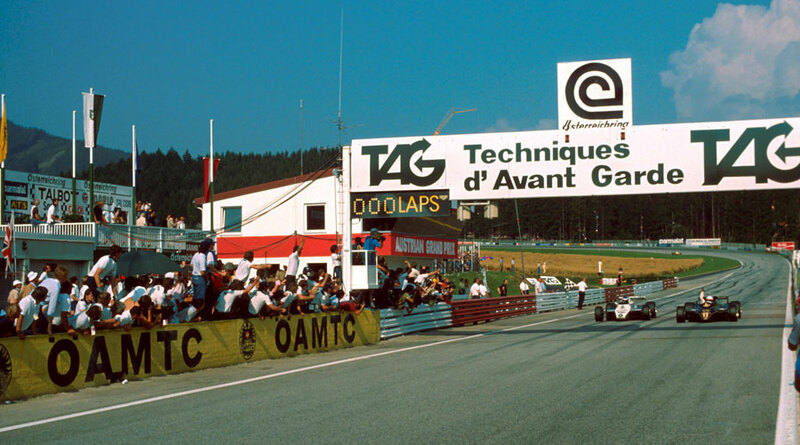 Then with four laps to go Prost parked his race-leading Renault with fuel injection failure and de Angelis led with the Williams bearing down on him. At the last corner they were nose to tail and as they approached the line Rosberg pulled alongside. He missed out by inches and de Angelis gave Lotus its first win since 1978. Team boss Colin Chapman was so delighted that he jumped in front of de Angelis' car as it returned to the pits and suffered a sprained wrist as it ran him over. Third, almost unnoticed, came Laffite's Ligier.